During your first few visits to our office, we’ll simply want to to attain a better understanding about you and how we can benefit your health. We will ensure that you don’t feel unnecessarily hurried in any way, because we want to really listen and find out what we can do to best serve you. In this spirit, we’ve made all necessary paperwork online for the most convenience possible. After you’ve scheduled an appointment, we’ll request that you arrive about 15 minutes prior to your appointment begins so that you can fill out the required paperwork, if you haven’t done so online already. During your visit, you will meet with one of our medical professionals who will complete an initial exam and answer all of your questions related to your condition or questions regarding chiropractic care, in general. 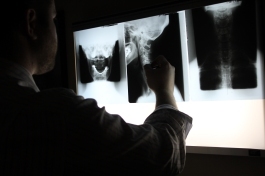 Depending on the doctor’s findings he or she may request a set of X-rays to be taken of the affected area (ex. cervical spine, lumbar spine, shoulder, etc). On your second visit, your Report Of Findings, you will review the X-rays with the doctor along with receiving a full report and explanation of his or her findings, and develop a care plan specifically tailored to your needs. While it is optional, we strongly recommend that you attend one of our Spinal Care Classes during this visit. This 30-45 minutes class will answer many questions that our new patients typically have. This is an interactive class and questions are encouraged! Please view our calendar to see when the next Spinal Care Class is available. We look forward to getting to know you and your health goals and concerns. We encourage you to contact Damato Chiropractic Center of Glastonbury today to set up a consultation. Your first visit will approximately take 45-60 minutes. This includes a comprehensive exam by the doctor, orthopedic tests, and x-rays (if necessary). The doctor is happy to answer any questions that you may have. Do I need to bring my x-rays from my old chiropractor? If the x-rays were taken within the last 12 months, it would be helpful to view those x-rays. If the doctor is able to use those x-rays we will make copies and keep them in your file. If they are older than 12 months, we will retake the x-rays in our office with our state of the art digital x-ray. We are in-network will all of the major insurance carriers. View our “Payment Options” page for more details. For your convenience, we are open 6 days each week! View our Contact Us page for up to date hours.